Fantastic weather today. Winds 5 – 10 knots, and we have lots of blue sky. Other than a long, 2 metre swell you’d have to describe the sea as calm. We have a group on board, led by Maeve Lohan from the University of Plymouth, who are going to measure the amount of iron in the sea. Iron is a nutrient that the microbial plants in the ocean need. It occurs in the ocean in very small concentrations, and so is a real challenge to measure. Much of the challenge is because ocean scientists need to make the measurements from steel ships, so there is huge potential for contaminating the samples with iron from the ship or our equipment. The instruments used by the iron scientists are all made from titanium or plastic, and they do all of their work is a special “clean lab” on the ship, into which the rest of us are forbidden to go. 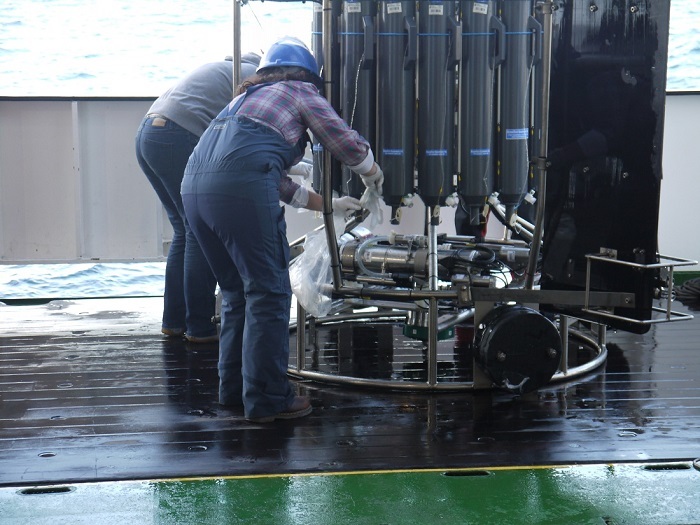 When their titanium instruments come on board after collecting water samples, Maeve and her colleagues rush forward with a bag of polythene gloves which are all put onto the taps of the sample bottles so that they don’t get contaminated while on deck.